The motor industry in Canada is always looking at new ways to prove that their products will be able to withstand the harsh winters. It appears that a motor supplies company who wanted to prove their new car battery could withstand freezing temperatures has done just that. Canadian Tire based in Ontario has built a 15,000lb truck comprised totally of ice. Everything on the vehicle was sculpted from a block of ice except for the chassis, tires and vital mechanical components. In order to achieve this impressive achievement the company engineers took a 2005 GMC Silverado and totally stripped it down before fitting a steel frame to support the ice. Specially made fans were then installed to channel away hot air and exhaust fumes that would damage the structure of the vehicle by melting the impressive exterior. The ice was cut in custom pieces and “welded” using water. 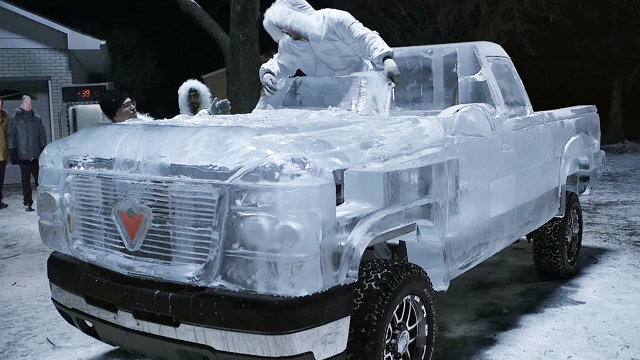 The ice truck was initially only created to demonstrate the power of Canadian Tire’s new battery but the icy pick- up truck wasn’t simply used for commercial purposes. The truck actually ended up being put to more practical use and has set a new world record. The vehicle was driven for 1 mile to set a new category Guinness record. There is no doubt that this truck is cool in more ways than one.